For city dwellers around the world, the starry night sky is something we rarely get to admire. Instead of gazing up at Ursa Major and Cassiopeia, we’re treated to flickering city street lights and lingering smog. To draw attention to the fact that light and air pollution are making our night sky disappear, The Windmill Factory art collective has recreated the night sky in the most unusual of places: New York City’s Hudson River. Called ‘Reflecting the Stars,’ the eco-art installation consists of 201 solar-powered LED lights installed on a decaying pier off of Hudson River Park. Up through October 25, the artwork aims to give New Yorkers a chance to experience the stars. The reason we can't see the stars in the sky is largely because of light pollution... Which this exhibit contributes to. Way to go. http://en.wikipedia.org/wiki/Light_pollution Irony or hypocrisy... you be the judge. For city dwellers around the world, the starry night sky is something we rarely get to admire. Instead of gazing up at Ursa Major and Cassiopeia, we're treated to flickering city street lights and lingering smog. To draw attention to the fact that light and air pollution are making our night sky disappear, The Windmill Factory art collective has recreated the night sky in the most unusual of places: New York City's Hudson River. 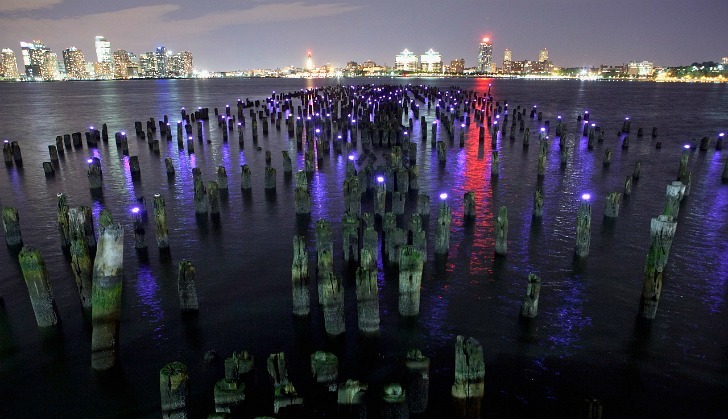 Called 'Reflecting the Stars,' the eco-art installation consists of 201 solar-powered LED lights installed on a decaying pier off of Hudson River Park. Up through October 25, the artwork aims to give New Yorkers a chance to experience the stars.